30058 STAP is a Star Wars set released in 2012. This set includes a brown STAP with a translucent stand to allow the model to stand upright, and attempts to make it appear as if the STAP were hovering. The model has two laser cannons, and a piece for a minifigure to grip onto to ride the vehicle. The STAP has a brown colour scheme, indicating that is it designed to be a Trade Federation STAP as opposed to one used by the CIS, which were commonly coloured blue. 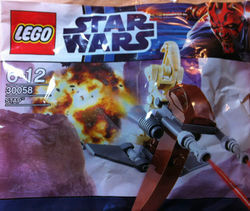 The set includes one minifigure- a Battle Droid without any weapons. The Single Trooper Aerial Platform, commonly known as a STAP, was a vehicle commonly used by Battle Droids of the Trade Federation, and later the Confederacy of Independent Systems. In combat, STAPs relied heavily on their speed to avoid enemy fire, and were armed with two laser cannons. This is the second STAP set to be released in a polybag. This page was last edited on 8 January 2018, at 22:04.